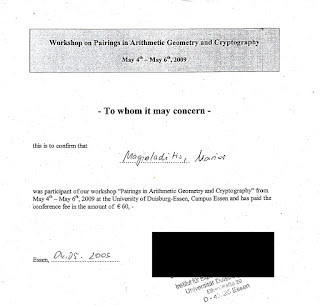 ECC 2009 is the 13th in a series of annual workshops dedicated to the study of elliptic curve cryptography and related areas. Over the past years the ECC conference series has broadened its scope beyond elliptic curve cryptography and now covers a wide range of areas within modern cryptography. For instance, past ECC conferences included presentations on hyperelliptic curve cryptography, pairing-based cryptography, side-channel attacks, voting protocols, quantum key distribution, AES, hash functions, and implementation issues. This year the Workshop was hosted by The University of Calgary, August 24-26, 2009 at Calgary, Alberta, Canada. I stayed at Travelodge (located in Motel Village, near the University of Calgary) 2227 Banff Trail NW. 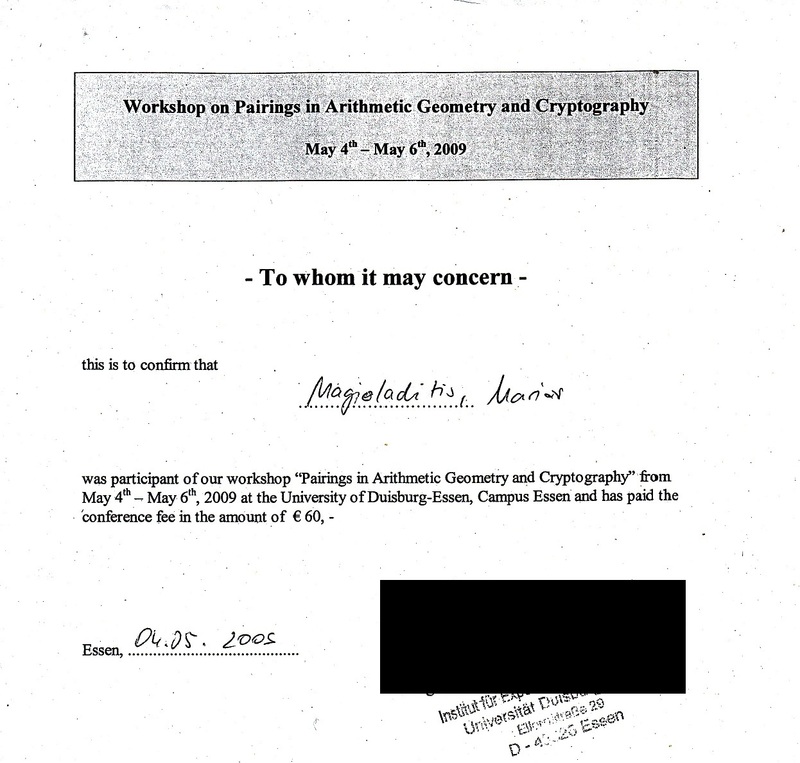 I also participated to the Elliptic Curve Cryptography Summer School that was held the week before the ECC 2009 Workshop. The summer school ran from August 19 until August 22. The scholarship committee offereed me my accommodations for the duration of both events and the registration fees. The travel expences were coverd by the University of Oldenburg. I have been to almost all EC Workshops since 2004 till this one. During the event I stayed at Harnack-Haus and shared a room with my colleague Arne Grenzebach. The organisers covered our expenses (travel, stay and registration fees). Abstract. In 2005, Jao, Miller, and Venkatesan proved that the DLP of elliptic curves with the same endomorhism ring is random reducible under the GRH. 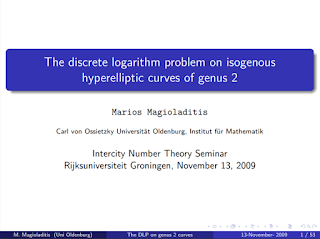 In this talk, we discuss a possible generalization of this result to hyperelliptic curves of genus 2 (and 3) defined over a finite field and show the difficulties involved. 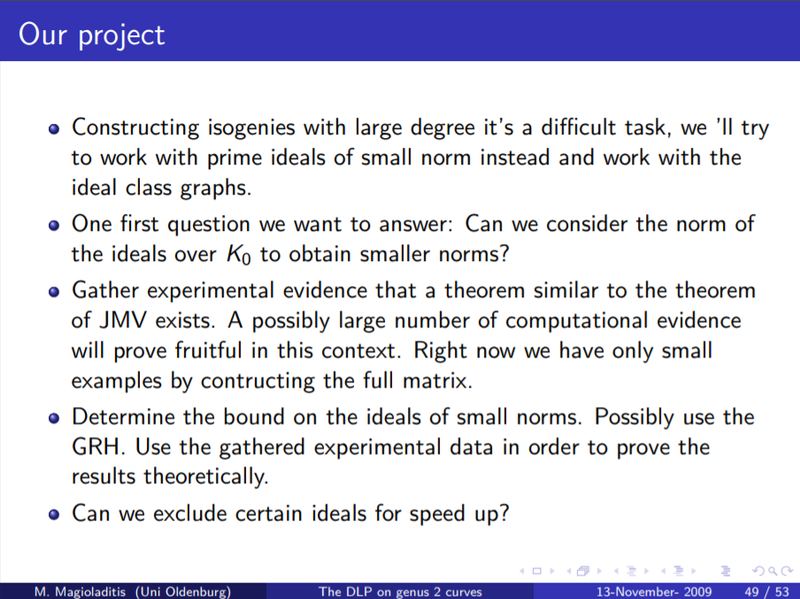 First, we explain the role of the endomorphism rings of the Jacobian and the polarization. 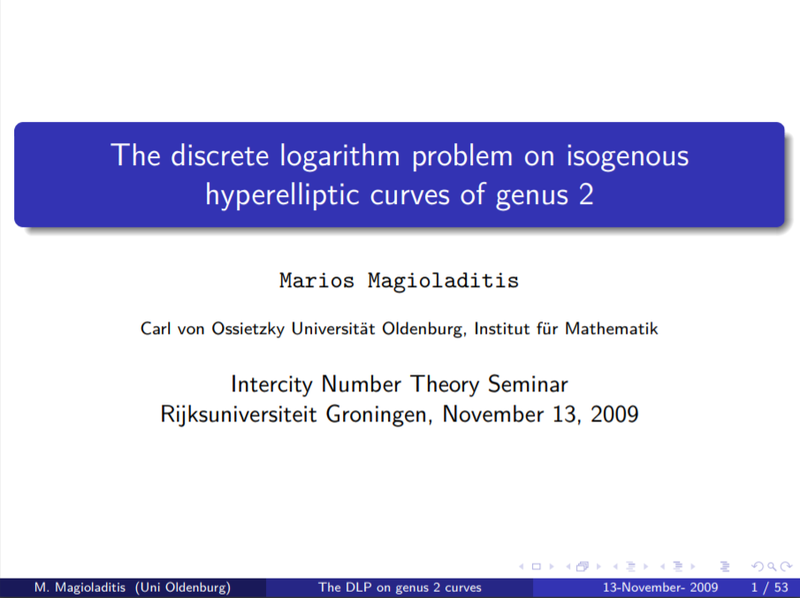 Following the work of Jao, Miller and Venkatesan, we construct isogeny graphs for genus 2 curves. Specifically, we discuss the connection between isogenies and ideal classes in the Jacobian of these curves. 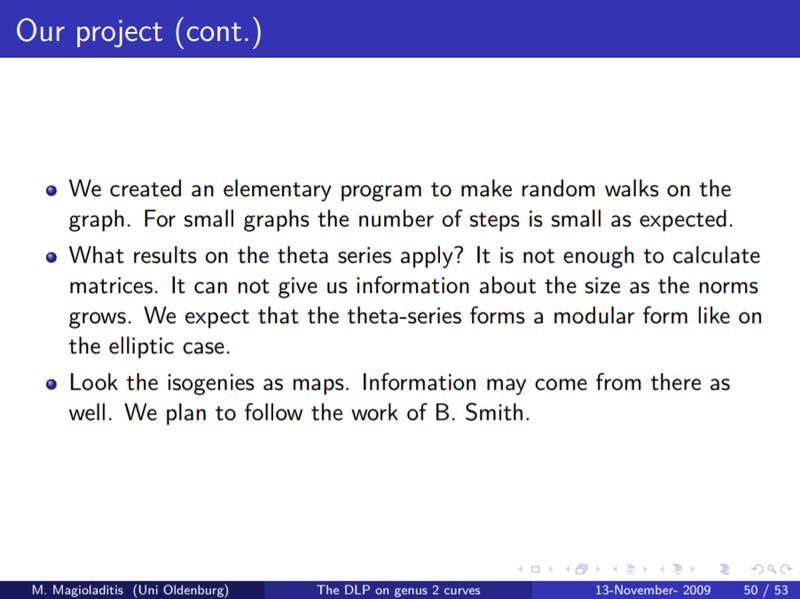 This project is research in progress and we describe the current status of this research. On 11-12 September 2009. I attended a workshop on Factoring Large Numbers at the Ruhr-University Bochum (BSI-Projekt "Faktorisieren großer Zahlen"). It was organized by the Federal Office for Information Security (BSI) and the Chair of Cryptology and IT-Security. The workshop took place in Veranstaltungsraum 2 (room number 01/53), which is located at level 01 in the mensa building. 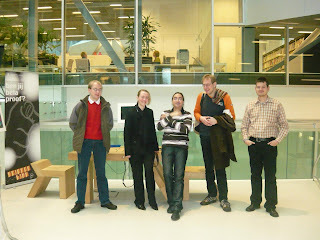 I travelled with my collegues to Bochum from Oldenburg via Osnabrück and the return tour was via Bremen. 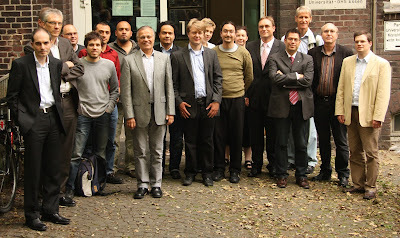 Invited speakers to the workshop were Daniel J. Bernstein (University of Illinois at Chicago), Willi Geiselmann (Karlsruhe University), Antoine Joux (Université de Versailles), Tanja Lange (Technische Universiteit Eindhoven), Claus-Peter Schnorr (Goethe-University Frankfurt) and Francesco Sica. During the evening of 11 September I went to Starlight Express Theater for a beautiful show. Στις 9 Ιουλίου 2009 διοργανώθηκε Festkolloquium και Oberseminar προς τιμήν του Prof. Dr. Dr. h.c. Gerhard Frey για την τεράστια συνεισφορά του στην Αλγεβρική Γεωμετρία και την Κρυπτογραφία. Το συμπόσιο πραγματοποιήθηκε στο Ινστιτούτο Πειραματικών Μαθηματικών (Institute for Experimental Mathematics) στο Έσσεν της Γερμανίας. 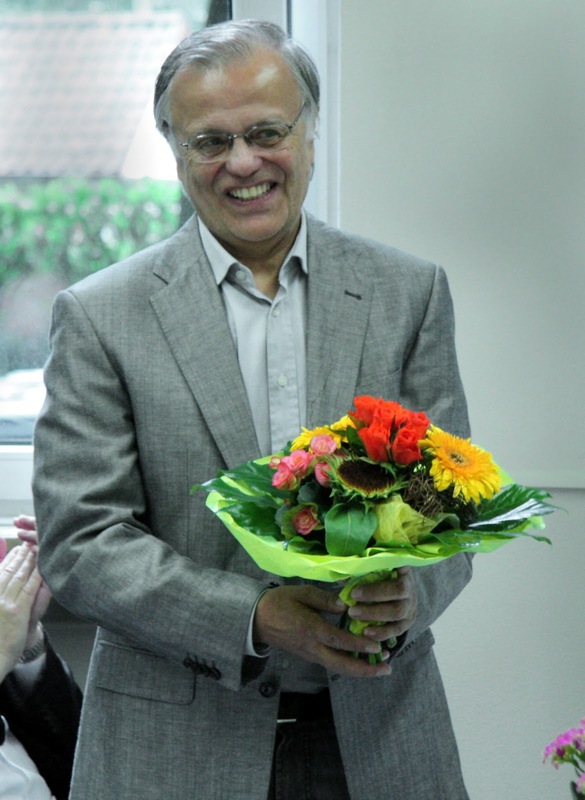 Ο Prof. Dr. Dr. h.c. Gerhard Frey υπήρξε διευθυντής του Ινστιτούτο το οποίο ιδρύθηκε το 1989. Την ευθύνη της οργάνωσης είχαν οι G. Böckle, H.-G. Rück και G. Wiese. Ένας εκ των ομιλητών ήταν ο Moshe Jarden, μαθηματικός και καλός φίλος του G. Frey. Φυσικά, υπήρξαν και οι απαραίτητες φωτογραφίες με το σύνολο των προσκεκλημένων και μια με τους μαθητές του καθηγητή, ανάμεσά τους πολλοί πετυχημένοι μαθηματικοί και κρυπτογράφοι. Είναι τεράστια η τιμή που τον γνώρισα και υπήρξα μαθητής του για πολλά χρόνια. Θα ήταν φυσικά αδύνατο να λείπω από αυτή τη συνάντηση. 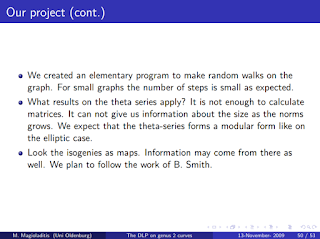 FP6 Research and Training Network GTEM [Galois Theory and Explicit Methods], under the guidance of Herr Prof. Dr. Gerhard Frey, organised a Workshop on Pairings in Arithmetic Geometry and Cryptography at the Institute of Experimental Mathematics. I am a Junior member of this research group and I participated in the workshop. 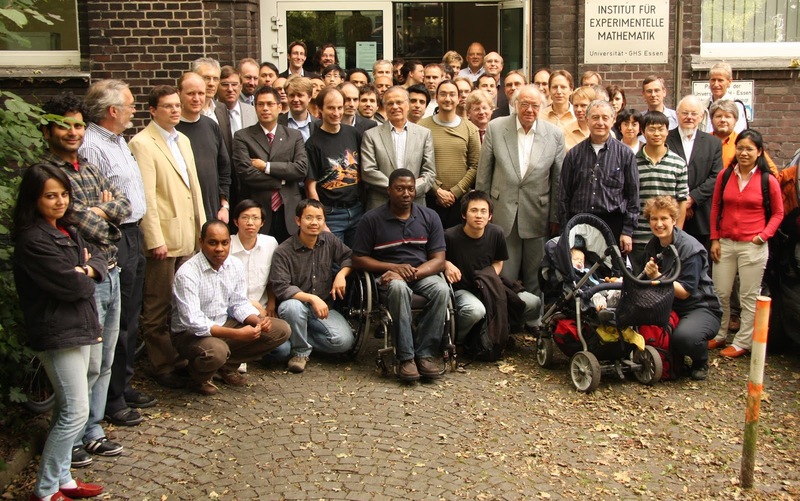 The workshop took place at May 4, 5 and 6 , 2009. 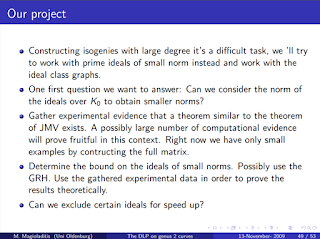 In the workshop we studied bilinear structures on ideal class groups of curves over finite fields induced by duality theorems of class field theory. 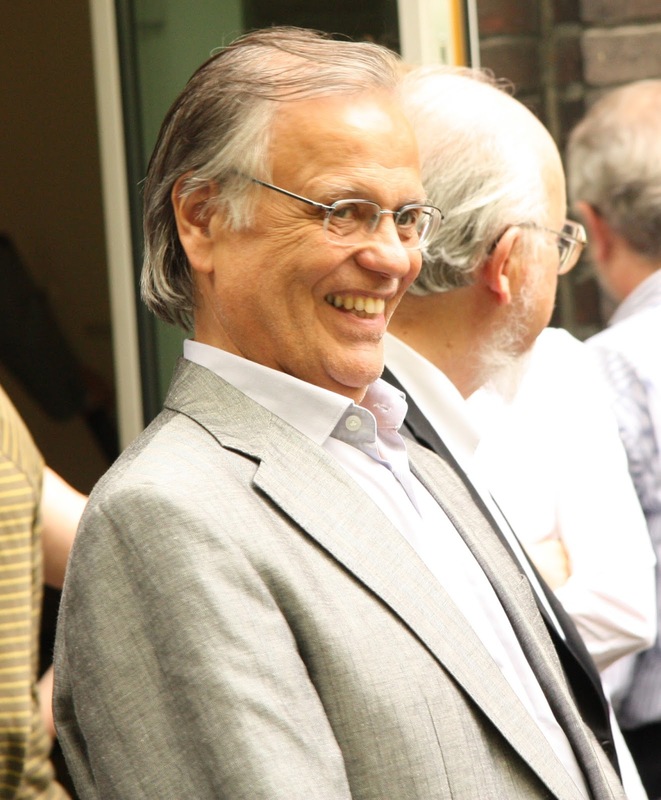 Computational aspects as well as applications to public key cryptography were in the center of the talks. Some of the speakers were P. Barreto, S.Duquesne, D.M. Freeman, G. Frey, F. Hess, D. Lubicz, M. Naehrig, M. Scott and F. Vercauteren.